This is me, Brenda, Margaret (owner of Sparkle n Sprinkle) and Sherree, in the booth at Stampfest in Orlando. We had such a great time. It was busy, busy....a lot of good deals. We did a make-n-take Friday, then shopping was open for Saturday and Sunday. We saw Cheryl and Angela, Barb and Linda there. I had a chance to walk around a little on Sunday morning before we opened and I saw some cards done on mirror cardstock using a silver embossing powder. So when I got home I tried my own. 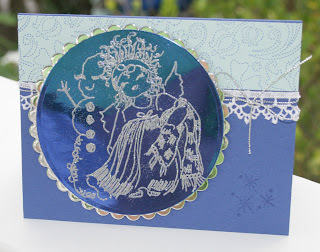 These are both using Silver Lightning EP and mirror cardstock from Sparkle n Sprinkle. It is so hard to get a good photo. They are so much prettier in real life. 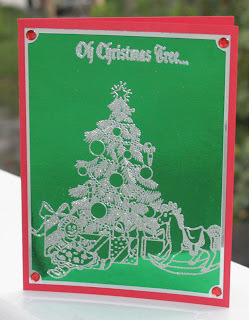 The first card uses the Christmas Tree from a plate of stamps. I stamped on green mirror cardstock, with Versamark and embossed, I used the corner ticket punch. I layered it on silver mirror cardstock and put some red rhinestones in the corners. The card base is Real Red. On this sweet card I used blue mirror cardstock and stamped Brynn and my new circle Nestibilities that I bought at Stampfest. I used the silver mirror for the scallop Nestie behind it. The card base if Brilliant Blue. I stamped Stitched from Stampin Up! in Brilliant Blue on Soft Sky for the top piece. The lace was put down with 1/8" double sided tape. The snowflakes in the corner were stamped with versamark as a watermark on the card. The cards really do shine and sparkle. Hope you enjoy.